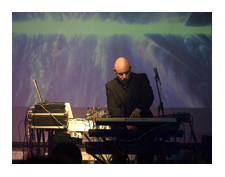 The very first Geigertek live performance was as support act to leading U.K. electronic music composer and performer, David Wright at the Fisher Theatre, in the Suffolk town of Bungay. 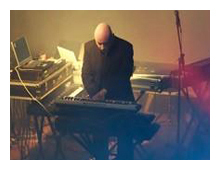 Not only was this the first live performance for Geigertek, but also the first live music perfomance for Neil Fellowes in more than 20 years. 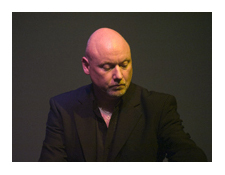 The Bungay concert was a successful evening, with 77 David Wright fans turned out to see Geigertek open the evening with a live version of the debut album "The Garden", released in August by AD Music. Although the title might sound 'new age' much of the music certainly isn't, sometime veering towards Kraftwerk territory. 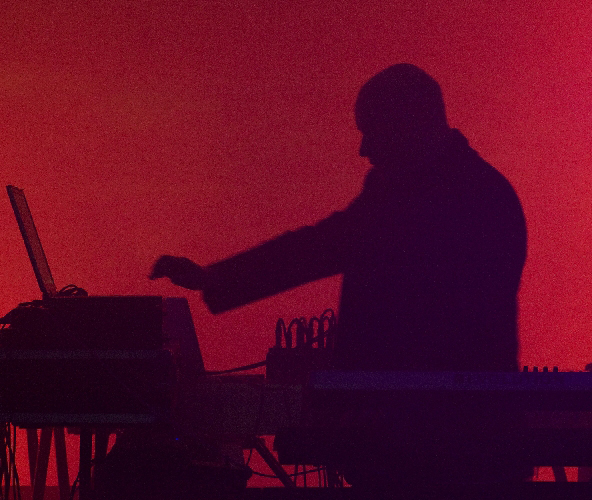 Overall, very impressive, melodic sequenced style music with structure and some considerable style. As said, this was Neil Fellowes's first concert for 20 years, but no-one would have guessed. The music was accompanied by nice graphics courtesy of AD Music's Dave Massey, and a lot of smoke and lights!!! After the interval, David Wright opened with a terrific live version of Cassini after which he was joined on stage by Klaus Cosmic Hoffmann, of Mind Over Matter fame. They continued with two tracks from David Wright's new album (sadly not available on the night) "Just an Illusion" and "State of Bliss". The combination of Klaus's guitar and David's keyboards worked well, particularly when Klaus played his Memotron as well - a great combination. A live version of "Walking with Ghosts" was also performed and this was just stunning - quite beautiful! Robert Fox joined proceedings to perform a superb improvised piece - very grand and symphonic with some wonderful interplay between the three musicians. Robert left the stage and David and Klaus continued with a new version of Beyond Paradise, Klaus playing some great sitar. The evening ended with more from the new album, Sun Dust/The Canyon. Robert and Geigertek returned to the stage for a very different encore version of Code Indigo's Code 14, everyone clearly having a lot of fun. All in all, a great night, fantastic graphics by Dave Massey although sometimes the lighting was a touch overpowering. Apparently there were a number of technical problems beforehand, but for the audience everything was great. Thought I'd say a few words about how much myself and my friends enjoyed David's concert on sunday night. We spent a great few days in and around Suffolk and Norfolk, it really is a beautiful part of the country, then to see David and Robert Fox play live and get to meet them along with yourself just added to a great few days. Great night, great venue, great music. Seen David Wright live before and this was as good as I've seen him perform. Not heard Geigertek before but he was excellent as well. Everyone seemed very relaxed and having a good time. Klaus Cosmic Hoffmann was a revelation. Not heard him before tonight and his guitar was fantastic. It complemented David's music perfectly. Please say they will do an album together? Wanted to congratulate everyone involved with a great concert on Sunday. 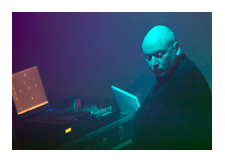 Geigertek was great, liked his set it was a good opening to the evening and I bought his album. Loved David's live version of Cassini, one of my favorite DW tracks. Klaus Hoffmann's guitar when he came on was terrific and the overall sound was fantastic. Loved the graphics and can't wait for the DVD. Thought the improvised music when Robert Fox came on was inspired. Seen them do that before but this was the best. I wasn't sure what to expect because this was my first time at a concert of this type. But I was impressed with a thoroughly professional and entertaining evening of music presented by two very accomplished musicians. The graphics and lighting added to the overall experience and made for a very enjoyable night out.